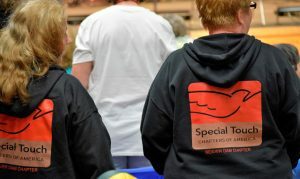 Chapters | Special Touch Ministry, Inc.
One of the greatest challenges for families who have a member with special needs is the isolation they feel. Special Touch Chapters address this problem by providing effective faith-based ministry to individuals who have disabilities and those who love and care for them. Gain new perspectives on how to share your faith with people who have intellectual or physical disabilities. Connect with people who provide understanding, help and encouragement. Network with others in your area who face similar challenges. Discover new opportunities for personal growth. Along with the over 50 million people with disabilities in America, there are families who are also dealing with the impact of disability on their lives. All of these people, impacted by disability, desire a caring environment, where their needs can be met, their abilities can be encouraged, supported, and used and appreciated. You can help make that possible by starting a Special Touch Chapter in your community! CLICK HERE for more information on starting a Special Touch Chapter. We encourage you to read this through, speak with your family and pastor, and pray about your decision before contacting the Chapter Director at trementozzi@specialtouch.org. Temporarily meeting at First Lutheran Church, 311 Mackie St, Beaver Dam, WI. Contact for additional meeting information. Meets: 1st Saturday of each month. Contact for further meeting details.